Handmade Detroit | Go, Craft Revival! Go, green crafts! Go, Craft Revival! Go, green crafts! The Loving Touch in downtown Ferndale. Lots of great shopping, lots of nice vendors… you get the idea. Oh! Did I mention that Mother’s Day is right around the corner? I’ll make you a bet your mom likes handmade gifts… just sayin’. 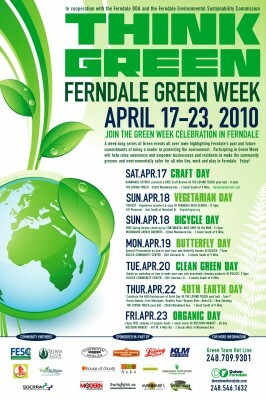 We’re also happy to announce that Craft Revival kicks off Day 1 of Ferndale’s Green Week. Don’t forget to bring your reusable bag for your Craft Revival purchases! Check out our vendors and be ready to say “Hey, crafter!” next Saturday from 11 a.m. to 6 p.m. The poster is small, so here’s a link to all the Green Week events! How about a link that doesn’t force us to log in to Facebook?